This website contains general information about DNR; its role, history, officers and how you can interact with it. 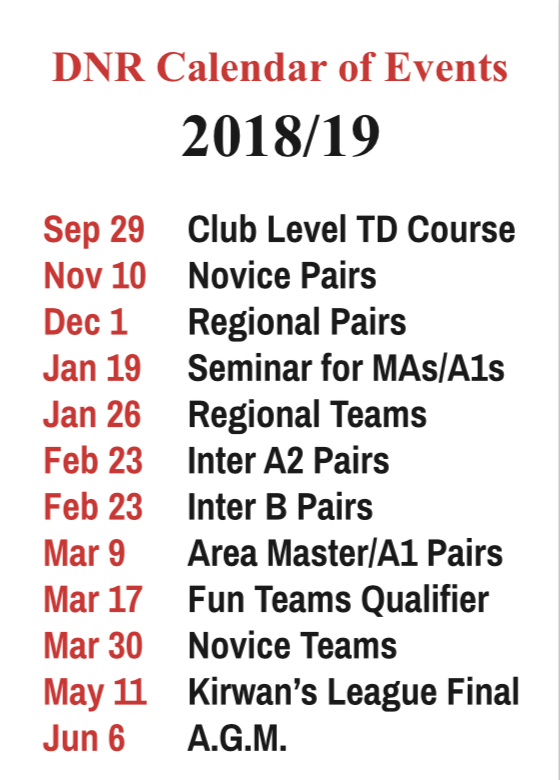 In addition, you will find information about forthcoming Regional Competitions, Courses, Seminars and Meetings. When the Kirwan's League is in progress, ongoing results are posted here. Results of previous competitions are also listed. All our events can be booked online here. The online entry forms typically appear three to four weeks prior to the event in question and remain live until the day before the event takes place. In addition, there is a page on which teachers in the region can advertise their classes. We are also happy to facilitate any members in the Region who wish to promote any bridge related activities. Finally, there is an extensive list of links to bridge related websites. Welcome to the website of the Dublin North Region of the Contract Bridge Association of Ireland. The Dublin North Region (DNR) covers clubs in the north-eastern sections of Dublin City and County, north of the Liffey.